Daughter of the Dancers / Muchachita! Signed verso print in ink. Collector's wet stamp verso print: "Lester Burbank Bridaham/624 North "C" St/Tacoma, Wa. 98403/Phone: (206) 383 3020"
Inscribed verso print in ink: "¡Muchachita!/M Alvarez Bravo/México". Inscribed verso print at center in pencil in a later unknown hand: "18"; at lower left: "Meal 19". 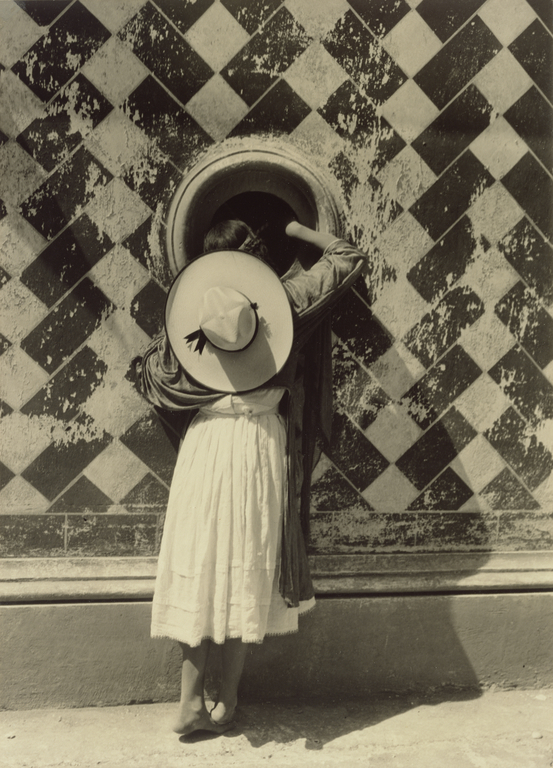 With her back to the camera, a girl in a bright white cotton skirt peers into a circular black hole or window cut into a patterned wall with peeling paint. Her head is all but obscured by a wide-brimmed hat that echoes the shape of the portal. She stands on her toes ever so tentatively, her bare right foot overlapping her left as if she is trying to create her own stepping stair. Her right hand disappears into the void as she investigates the unseen contents within. This photograph by Manuel Alvarez Bravo establishes a contrast between her innocence and the fearful unknown. Roche, Denis. Manuel Alvarez Bravo (Paris: Photogalerie, 1976? ), pl. VIII. Livingston, Jane. M Alvarez Bravo, exh. cat. (Boston, Mass. : D. R. Godine; Washington, D.C.: Corcoran Gallery of Art, 1978), pl. 58. Academia de Artes. Manuel Alvarez Bravo (Mexico: Academia de Artes, 1980), p. 17. Witken-Berley, Ltd. Manuel Alvarez Bravo (Roslyn Heights, N.Y.: Witkin-Berley, Ltd., 1980), p. 5. Perez, Nissan N. Dreams--Visions--Metaphors: The Photographs of Manuel Alvarez Bravo, exh. catalogue, essay by Ian Jeffrey (Jerusalem: Israel Museum, 1983), pl. 65. Salas Pablo Ruíz Picasso. Manuel Álvarez Bravo, exh. cat. (Madrid: Ministerio de Cultura, Dirección General de Bellas Artes y Archivos, 1985), pl. 25. Musée de Arte Moderne. Manuel Alvarez Bravo: 303 Photographies, 1920-1986 (Paris: Paris-musées; Paris audiovisuel, 1986), pl. 54. Galerie Sonia Zannettacci. L'oeil du Minotaure: Ubac, Brassaï, Alvarez Bravo, Bellmer, Man Ray, exh. cat. (Genève: Sonia Zannettacci, 1987). Del Conde, Teresa. Mucho Sol (México: Fondo de Cultura Económica, 1989), p. 29. Masterpieces of the J. Paul Getty Museum: Photographs (Los Angeles: J. Paul Getty Museum, 1999), p. 105. Lesson in which students engage in visual and written activities that support the creative process of choreographing a solo dance composition.